ii) When inside the design editor. 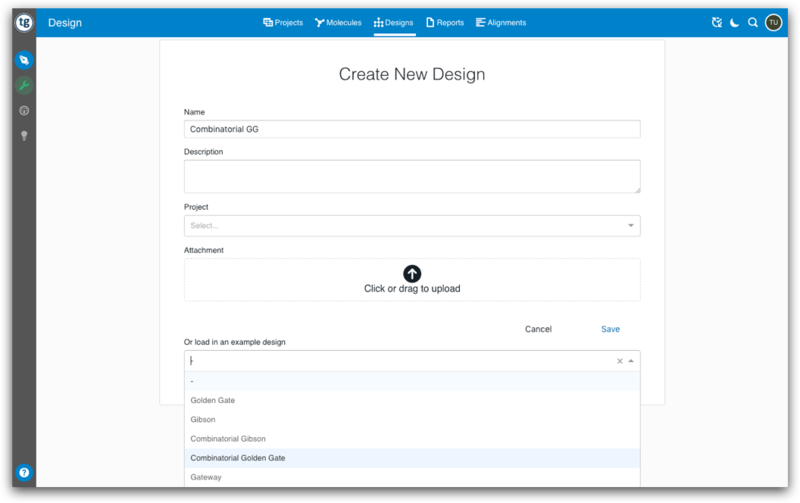 When creating a new design, you are given an option to load in an example design. Give your design a name, you can add a description and add the design to a Project if you want to, then choose from the dropdown menu at the bottom one of the five example designs available: Gibson, Golden Gate, Combinatorial Gibson, Combinatorial Golden Gate, Gateway. You can read more about these assembly methods in this article. After click Save, you will be directed to the Design Editor, which will be loaded with DNA parts that are defined in the selected example design. When you load up an example design, the parts associated with these designs will be automatically saved in the DNA Parts Library, which can be reused in other designs. The image below is an example of a Combinatorial Golden Gate design. Another way to access our example designs and data is to click on the Examples tab within the design editor and select the example design of interest.